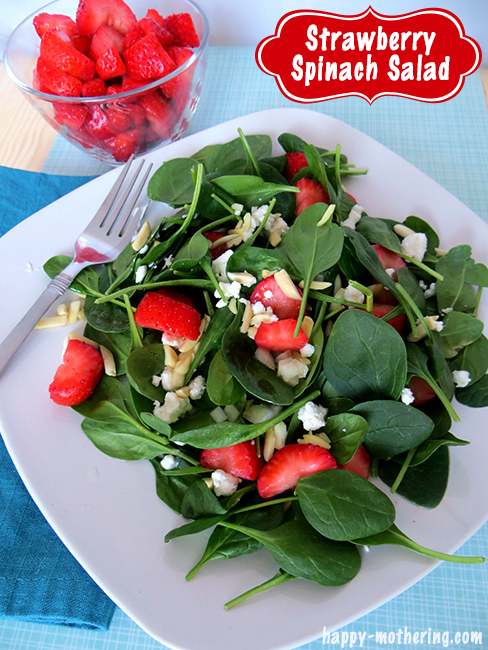 Strawberry Spinach Salad is one of my favorite salads to whip up on a warm summer day. Even though we got a bit of snow last week, I am still enjoying Spring. I posted about dinner salads previously, but I also love a good salad for lunch! The first time I saw strawberry spinach salad was at a health food store in San Diego, I thought it was weird and wasn’t sure if I wanted to try it. However, my curiosity got the best of me, so I ordered some to go for lunch. I was pleasantly surprised by how well the flavors of strawberries go with spinach and goat cheese. I have ordered the same salad many times since, and I love making my own salads at home as well. 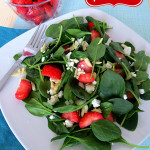 This recipe for strawberry spinach salad is very easy to make at home, and it’s more affordable and you know what is going into your dressing (so many prepared dressings include GMO soy or canola oil). In a small mixing bowl, whisk your minced onion into the raspberry vinegar and extra virgin olive oil. Chop the strawberries into bite sized pieces. In large bowl, mix the baby spinach with the organic strawberries. Sprinkle the sliced almonds and crumbled goat cheese over the top of the spinach and strawberries. Right before you're ready to serve the salad, drizzle the simple homemade dressing over the salad and toss gently. Do you enjoy Strawberry Spinach Salad? What is you favorite salad combination for lunch? This looks delicious!! I am always a big fan of spinach and strawberries… and together sounds like a match made in heaven. Looks delicious! I will have to make this for lunch sometime this week! I used to have a recipe similar to this and I lost it and forgot about it. Thanks for sharing! I’m going to make this tomorrow for dinner! I LOVE a good strawberry spinach salad. The sweet of the strawberries with the tang of the cheese…delicious. Pinning! Yum! This looks like a great summer recipe! Usually I don’t mix fruit in meals but this looks good, I’m thinking I’d give it a try! Thanks for sharing with us at Marvelous Monday tonight – I love how fresh it looks – Pinned! I love strawberries and goat cheese! This salad looks so wonderful. We may just have to make this yummy looking salad for Easter…..!!! Oh, yum…looks delicious! This is going to be a nice refreshing change after all the chocolate consumption this weekend!! I love spinach salad with strawberries. This reminds me of one of my favorite salads. The goat cheese sounds great and so does the raspberry vinegar. I always have raspberry jam in my fridge (it my husband’s favorite) and when I want a raspberry vinaigrette I just mix a spoon full of jam with balsamic vinegar and oil. Spinach and strawberries = delish! This salad looks so yummy and healthy!! That dressing looks delicious, too! Thanks so much for sharing on Saturday Night Fever! Pinned to our group board! Thanks for stopping by #TheWeekendSocial and linking up! I have pinned, stumbled and shared your link across social media. I hope to see you again next week! Yumm! What a great recipe for Spring. I just pinned it for the future, but think I may add it to my menu this week too. This looks so good! Found you at Work it Wednesday. I would like to try this! Spinach and strawberries are my favorites! Got you from the Weekend Retreat party.